My Instagram account does a pretty perfect job of summing up this month. It started out with lots of crafty fun at home, and then I flew away to my next skating gig where I was sucked into the rehearsal vortex and was never heard from again. 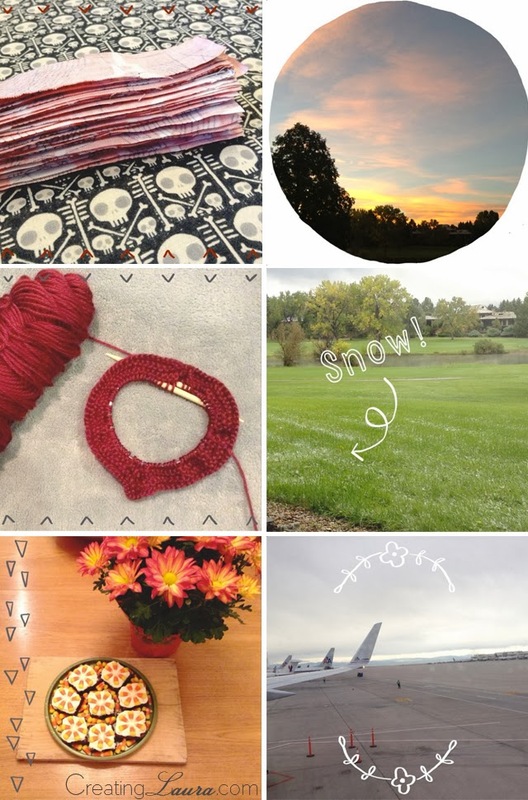 I made a fun Halloween photo backdrop from strips of fabric, and I took in the lovely views in my own backyard. I did some knitting when I really should have been packing, which is pretty standard. I also had a quick glimpse of snow, which made me want to stay in Colorado even more. I did some baking for my boyfriend, and then suddenly (much more suddenly than I had expected) I flew off to my next skating contract and spent the next four weeks in rehearsals. Luckily, we finally opened our show yesterday, and things will be back to normal now. I'm so, so, so excited about it! I have tons of blogging and crafting ideas in mind for the coming month and I can't wait to get them going. Those candy corn treats are so pretty! Have a wonderful weekend! Ooooh you keep that snow, I don't want it here yet! Thank you for sharing. Do you ever print out your IG's? If so, what service do you use? I just tried Snapstagram to print instagram pics! No, I never print them out, I really should though. It's so nice to have actual prints in this digital era. That's a beautiful photo of a sunset! Or perhaps a sunrise...either way.